Wheel alignment is one of the fastest growing and most profitable automotive services. VAMAG systems make accurate car alignment quick and easy within an affordable budget. The Vector Camera 4-wheel aligner is a perfect step up from a basic laser system. 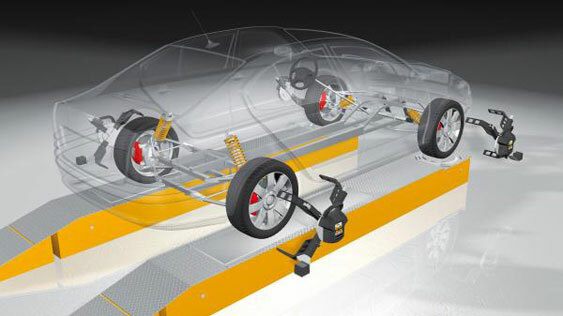 And Vamag’s leading-edge 3-D system, New Dimension, is the perfect solution for high-volume wheel alignment workshops. With Vamag's 4-wheel aligner you can offer your customers a premium service. Vamag is one of Europe's leading suppliers of high quality wheel alignment systems for cars, having been manufacturing garage equipment for over 30 years. Haweka, with its well-established 20 year track record, is partnering Vamag to bring their wheel alignment equipment to UK customers. Haweka technicians offer on-site demonstrations, training and product support.